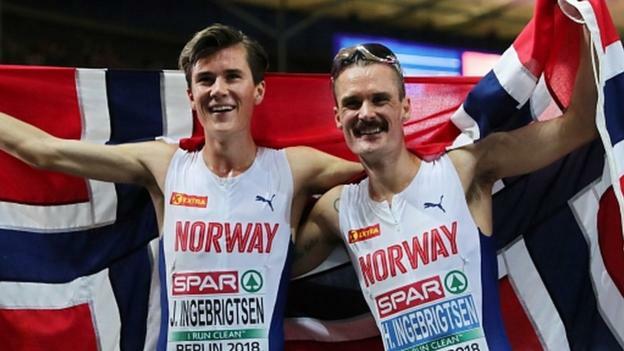 Norway’s Jakob Ingebrigtsen beat his older brother to win European 5,000m gold just a day after clinching the 1500m title in Berlin. In doing so, the 17-year-old became the first athlete to complete the double at European level. His brother Henrik, 27, finished second, 1.69 seconds behind his younger sibling, as France’s Morhad Amdouni won the bronze medal. “It was a little crazy to get this medal today,” said Jakob. “Winning a second title in two days is also the result of having done this my whole life. Jakob Ingebrigtsen’s time of 13:17.06 was a new European under-20 record. He had beaten both Henrik, who won the title in 2012, and their other brother Filip – the reigning champion from 2016 – to win 1500m gold on Friday and become the youngest winner on the European Championships track in 84 years. Filip missed the 5,000m final with a rib injury. Speaking on BBC TV, British long distance athlete Paula Radcliffe said: “Jakob Ingebrigtsen just goes to the front when he wants and dares everyone else to come alongside him. Nobody dares to go past him and he’s 17. At the age of 16, Jakob became the youngest man ever to break the four-minute mile and broke the European 1500m junior record with a 3:31.18 run in Monaco last month. “In two years’ time, we will be back to win four medals, not just three,” added Henrik. The Ingebrigtsens weren’t the only brothers in action at Berlin’s Olympic Stadium on Saturday, as Dylan, Jonathan and Kevin Borlee won 4x400m relay gold for Belgium alongside Jonathan Sacoor.